Please test the supplement "offset=8" as a sufficient space to avoid the UUID will be overwritten. Alternativily it should be tested to use the Option "skip" instead. I had the same problem after installing Kubuntu 14.04 64bit. During the installation process I mounted an existing home partition encrypted with ecryptfs. Result: The swap partition was not available/mounted. After manually implementing syscon-hh's solution in the first post, all is well. I should have added that sudo blkid reported a different UUID for the swap partition than the one used in /etc/crypttab. Replacing that one with the UUID reported by blkid did not solve the problem. This bug also affected me with Ubuntu 14.04 and encrypted home-directory. The swap partition existed but was not mounted as a crypted swap. and suspend to disk is possible. On Trusty, blkid is also unable to read the UUID of a swap partition of a Raring system, while that swap is working fine on Raring. I will check tomorrow what blkid does on Raring. @syscon-hh: I hope to be able to test your 'skip' option tomorrow. @ syscon-hh: offset=8 appears to work, skip=8 does not help to preserve the UUID after a reboot (skip without a value is ignored by cryptdisks_start). @ syscon-hh: or did you mean offset=8,skip=0? I will test that too. @ syscon-hh: I do not see any difference using it with offset=8 or offset=8,skip=0. never both in one line. for further Informations see "man cryptsetup" -> "options"
@ syscon-hh: in that case, offset=8 works, skip=8 does not. So offset=8 it is. Hello everyone, I reached here from bug Bug #1301383. I followed through all the comments, but I've still run into problems after rebooting. Comment #3 by syscon-hh <https://bugs.launchpad.net/ubuntu/+source/ecryptfs-utils/+bug/1310058/comments/3> and Albert's detailed instructions <https://bugs.launchpad.net/ubuntu/+source/ubiquity/+bug/1301383/comments/6> have been extremely helpful. "Then you can convert your unencrypted swap into an encrypted one, using sudo ecryptfs-setup-swap. That will now work fine, because you have patched the file to include "offset=8" in the /etc/crypttab file. Again, use swapon -s to verify that the swap is enabled; but now it should display /dev/mapper/cryptswap1 as device." ...swap is not activated after a reboot. I confirmed that the latest changes to /etc/fstab and /etc/crypttab made by ecryptfs-setup-swap have remained intact. And swap was up and running again! Any suggestions on what's happening here? I can confirm your workaround #3. UUID alongside offset=8 is working well in my case. Ouch. This was painful to resolve. The workarounds proposed do not work "out of the box" when encountered after a "default" installation of 14.04.01 using encrypted fs and home directory. Under those conditions, the encrypted swap is named ubuntu--vg-swap_1. Following the instrucions in post 3, 9, and 17 leave the system in a slightly odd state as the ubuntu--vg-swap_1 is properly setup, but the /etc/crypttab has an entry for "cryptswap1" (which is why Ryokenau was having trouble). Wish I had time to detail proper fix, but I needed to manually adjust /etc/crypttab to point to proper ubuntu--vg-swap_1, and adjusting /etc/fstab with appropriate UUID for the swap file. and any proposed solution to clear the infamous message 'The disk drive for /dev/mapper/cryptswap1 is not ready yet or not present" was useless. But it was not a major problem, at least on my systems, because at the end the swap partition was mounted and was working despite the message. Now, the situation on Trusty is bad, because the cryptswap partition just doesn't work. That's why I don't believe this error should be flagged again as a duplicate of bug #953875.
and rebooting the system. So I guess the problem is due to a race condition of the /etc/init.d/cryptdisks-early script. If I disable it the swap partition is mounted automatically on every reboot. Don't forget to replace my sample UUID with the correct for your system. On my system offset=6 was sufficient, because cryptsetup already skips the two first sectors of the swap partition. CAUTION: you must replace /dev/sdaX with the correct swap partition for your system! What happened on Trusty was that cryptswap started using UUID instead of /dev/sdXY names, and the encryption with a random key overwrites the partition's UUID unless an offset in crypttab is used. So I wouldn't tag it as a duplicate of a Precise bug, a whole new problem was created by switching to UUID in Trusty. My problem with trusty seems to be two different bugs happening at the same time. The first, the UUID problem, that is solved with offset = 6 & mkswap, and the second, the hateful message 'The disk drive for /dev/mapper/cryptswap1 is not ready yet or not present' and the recurrent issue on some systems preventing ubuntu to mount the swap partition on some configurations. Using noauto to ignore the disk at boot an mounting it automatically using an alternative way solves it in precise & trusty. The message is so recurrent in various editions that I think ubiquity must implement some solution similar to my noauto solution when only encrypts the home user directory and the swap partition. I would keep the two problems in separate bugs, since they do not have the same cause. This is the bug for the problems with the partition UUID and the crypttab file. About power management settings being ignored, please ask on the forum of Ubuntu (or the distro you are using) or open a new bug. It should be unrelated to this bug, you just never saw this problem because you were never able to hibernate at all. That hibernate fails, is yet another different problem. It is by design that the encrypted swap created by ecryptfs-setup-swap won't work with hibernate. I think it has been discussed at length in other bug reports or on forums already, with other encryption methods (such as encryption with a password instead of a random key) being suggested as solutions. Not encrypting your swap would of course allow you to hibernate as well. In short, you already fixed the problem which this bug describes, the other problems which are left to fix are beyond the scope of this bug. As for #17, in my experience swap was activated sometimes, but not always, during reboot. Hi there, I believe I patched the issue in ecryptfs-setup-swap which causes this problem in the first place. This program now sets the swap's fstab to noauto, crypttab offset to 6, and creates a file in /etc/init which mounts the swap partition automatically as soon as it's ready. I beleve there are 2 problems with the current setup. The first one is caused by the cryptswap changing the uuid of the drive. This is fixed by using an offset of 6 (* 512 bits) to skip the portion where the uuid is apparently stored. The second one is caused by fstab trying to mount the swap before cryptab has encrypted the partition. This is fixed by mounting the partition with the /etc/init file. This program will still find multiple swap partitions on the harddrive, encrypt them, and mount them automatically at boot. Delete all mention to the swap partitions in your /etc/fstab and /etc/crypttab. Enable your swap partitions and make sure they are running working properly. and restart your computer . Now your swaps should all be encrypted and working! If this doesn't work for you please let me know. I would also like to add that this attachment is basically just automating #22's solution to the problem. The attachment "ecryptfs-setup-swap (patched)" seems to be a patch. If it isn't, please remove the "patch" flag from the attachment, remove the "patch" tag, and if you are a member of the ~ubuntu-reviewers, unsubscribe the team. Yes that is a patch for the ecryptfs-setup-swap script. If ubuntu were to use it to replace the current ecryptfs-setup-swap in the installation iso we would no longer have this bug. Yes this patch is working - but under *upstart* only. Using the coming up systemd feature this patch will destroy more than the patch helps. Well that's too bad. I'll try to find a way that doesn't use upstart then. Thanks for the information! I'll keep you guys posted. So, from what I can tell, this is the only way to do it while working with an init upstart system. 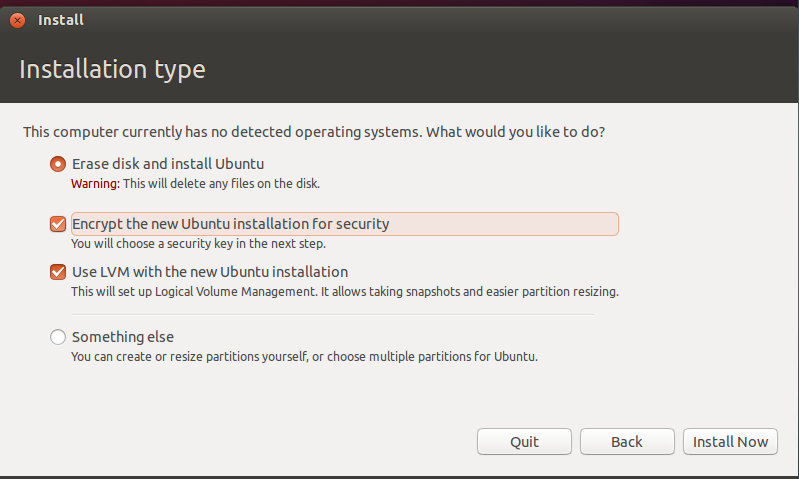 I suppose that when ubuntu makes that change, I'll just have to write another patch. I do believe archlinux had was having a similar problem with crypttab and uuid's. They use systemd but, they just assume you set it up yourself, using /dev/disk/by-id (wich is unique for every disk) (or apply an offset of 6). I also don't remember there being a problem after that, so maybe since they use systemd the issue is avoided (maybe). Okay, so I believe that I fixed the issue without using upstart. This version instead uses sysvinit instead. Please let me know what you think. This would fix the issue for the installer if it was added to the iso. Enable your swap partitions and make sure they are working properly. Should I create a ppa for this? Due to *systemd* will work no longer with *init.d* anyway. The version #39 makes nothing else then to provide the *crysetup* in background only. Required are *offset=8* - otherwise the given basis (swap-volume) will be destroid! For testing purpose only the *LABEL* definition has been used. Comments: -> */bin/sleep 5* -> t.b.d. - depends on volume / GiB to be crypted. I can confirm that *offset=8* in the line in */etc/crypttab* makes cryptswap survive reboots. I have tested it in Lubuntu Vivid 32-bit. I used the simple method described in comment #3. Don't get me wrong. I read this bug report, and I see that there are many comments that point forward to squashing the bug. 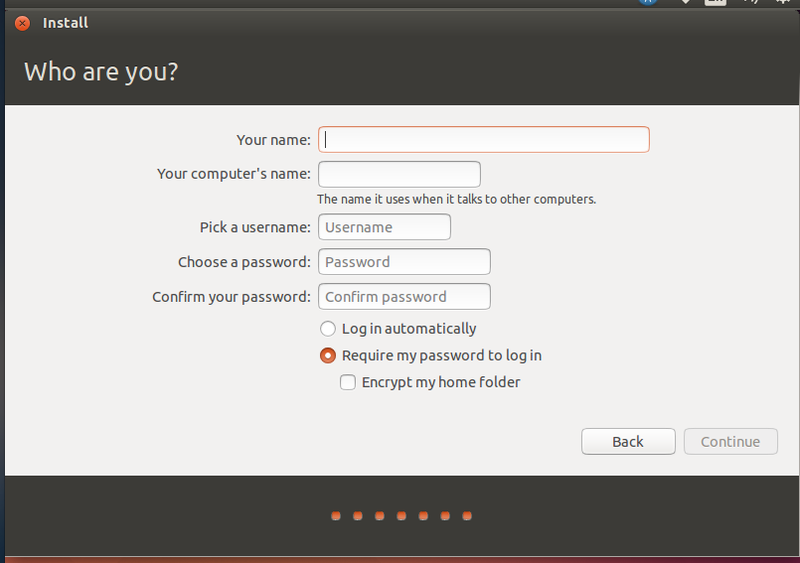 I was confronted with this bug simply because I checked "Encrypt home folders" during a fresh installation of Ubuntu LTS 14.04 . There seems to be a certain amount of unwillingness to resolve this issue because we are moving from Upstart to systemd. However, why not leave users then with at least a working unencrypted swap, instead of a non-functional encrypted swap? After all, during installation I checked for encrypting /home, not swap. Furthermore, the risks involved with a plain, unencrypted swap are very limited. which is actually squashed now. The working version of cryptswap is available when you install 15.04.